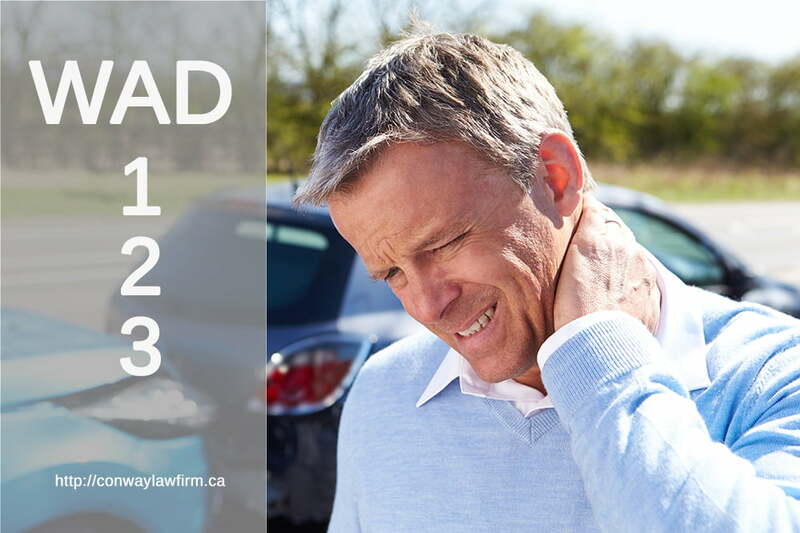 ‘WAD’ stands for ‘Whiplash Associated Disorder’. In its simplest terms, if you suffer an injury to your muscles or ligaments that can be described as a ‘sprain’ or a ‘strain’ you will likely be described (typically by a physiotherapist) as being a WAD 1 or WAD 2. This is only if you don’t have numbness/tingling in your arms, hands, legs or feet – in that case you should be described as having suffered a WAD 3. In other words, if you have numbness/tingling in your arms, hand, legs, or feet, you should be described as having a WAD 3. The importance of these classifications is that the insurance companies will tell you that you are only able to claim a maximum of roughly $4,800 for pain and suffering if you are diagnosed as being a WAD 1 or 2. This is WRONG. This is NOT what being diagnosed as a WAD 1 or 2 by your physiotherapist means. I have seen many many cases where the classification by the physiotherapist is wrong to begin with. Also, the Courts have made it clear that if you have ongoing chronic pain beyond six months, your claim may not be considered ‘minor’ and you may be entitled to proper compensation. Each case turns on its own facts – get some professional advice from a lawyer before speaking with any insurer. When people talk about whether an injury is “Minor” they are really referring to two pieces of legislation that the insurance industry lobbied the government to impose on people injured in car accidents. The first piece of legislation is called the Minor Injury Regulation (“MIR”). The second piece of legislation is called the Diagnostic and Treatment Protocols Regulation (“DTPR”). Regardless of whether or not you have been ‘diagnosed’ by a physiotherapist or chiropractor (or family doctor) as having a WAD I or WAD II, these diagnoses often change over time. If there is little or no improvement in your pain or symptoms over a period of months, there is often a realization that the injury is more serious than first thought. Often having an MRI will provide an explanation of the ongoing symptoms (as opposed to an x-ray, which will only show a fracture). There are also many exceptions to the so-called ‘Cap’ – don’t believe what you might have been told by an insurance adjuster. Their ‘default’ position is that all motor vehicle accident injured people have ‘minor’ injuries.